When you’re fitting a replacement Subaru engine or Subaru radiator, it can be difficult to get the trapped air to bleed out of the cooling system. You may already have your own system to bleed a Subaru cooling system, if not here are some ideas we found will work. The instructions below assume that you have the proper professional cooling system bleeding funnel: if you don’t please click here to go to our online Subaru accessory parts website where you can purchase a kit for a reasonable price, believe us when we say this kit will save you a lot of trouble! The instructions below include lifting the front of your Subaru, this can be very dangerous. Please make sure that you support the vehicle with approved stands, do not work under the vehicle while it is off the ground. Make sure that the hand brake is sufficient to hold the vehicle while you are working on it, if there is any doubt in your mind regarding safety STOP and do NOT PROCEED with these instructions until you are 100% sure that everything is safe. Warning: The water in the Subaru cooling system can reach boiling point, be VERY careful when working on the cooling system, keep away from any open hoses, radiator or header tank when racing the engine, use extreme caution at all times! Jack up the front of the vehicle as high as possible. Remove (or don’t fit) the highest heater hose, then fill the system until coolant comes out of the hose. Next, re-connect the heater hose. Fit a funnel system (available here) with the correct cap to the radiator or header tank; open the funnel tap; fill the system; and leave the funnel tap half open. Continually squeeze the top and bottom radiator hoses to force trapped air into the funnel, this can take 5-minutes or so. Now start your Subaru engine and turn the heater temperature up to maximum but the fan speed to minimum. Allow the engine to warm up and the thermostat to open so the temperature gauge reads normal. This can take 10 to 15 minutes, and be sure to keep topping up the funnel as required. Rev the engine between 2500 to 4000rpm off and on for 5 minutes, this should allow the water pump to force air out of the system. Note that warm air should be coming out of the heater vents, if not the heater must have air trapped in it, STOP the engine and allow to cool down then go back to step 2, above. If all seems normal remove the funnel system and top-up the radiator or header tank as well as the overflow bottle. Replace the radiator cap and run the engine for 5 minutes. Leave your Subaru OVERNIGHT and check the coolant levels in the morning, this is a critical step do NOT shortcut this, if you don’t do this step your Subaru will overheat! Any questions about bleeding Subaru engines? Please remember that bleeding any cooling system is dangerous, so please be aware and be careful. If you have any questions about the above procedure please phone Strong for Subaru in New Zealand 0800 634 0065 before you proceed: you can find our business hours here. We’ll be happy to answer your questions or talk through the process. 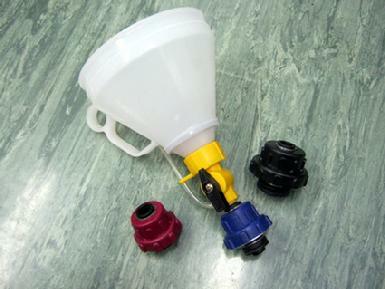 If you need a bleeding funnel kit then click here to go to our Subaru accessory parts site, you can buy one online or call into our Onehunga Auckland showroom to pick one up, and you really should!